CONNORVILLE – Sometimes the measure of a team is not only in how they can put a game away, but within how they can weather a storm from the team they are playing. Union Local showed plenty of such measure Tuesday evening, building an early lead then weathering a tough second quarter before pulling away from a game Buckeye Local squad by a 72-55 margin. 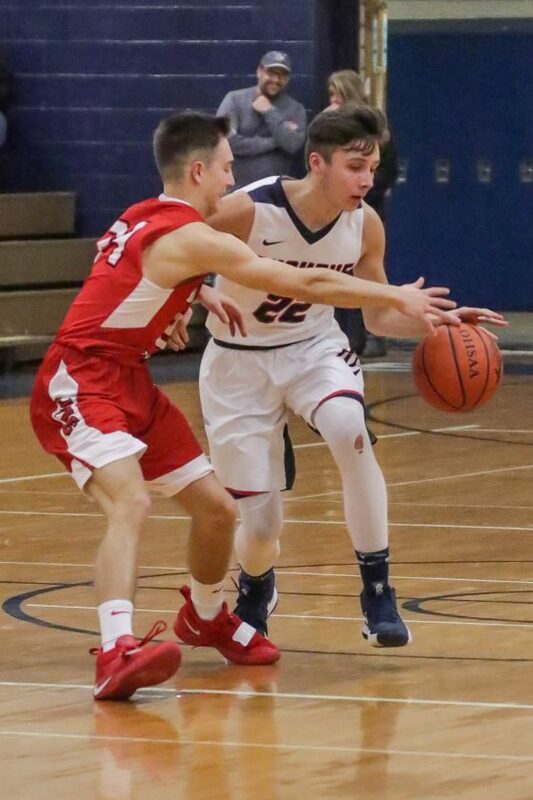 The Jets (7-9) opened up offensively with three of their eight three-pointers on the evening from Cal Kildow, Luke Merritt and Hunter McCort, respectively, but the Panthers (1-13) hung in there early behind the efforts of Luke and Hunter Darrah and Jacob Moffo forcing the Jets to call a timeout at the 4:34 mark of the first. Moffo hit a three shortly after that pause, however the visitors went on a tear, rushing to a 20-11 lead, getting the hosts to take a T.O. following a steal and layup by Merritt. By the end of the first, the Panthers were guilty of eight turnovers, Merritt had netted eight to go with 13 from Kildow, and the Jets led 28-17. The Panthers were not out of it, however. Behind the furious play of Cameron Grabits, the hosts mounted a comeback, rushing out to an 8-3 run to start the second. Although the Jets were guilty of just one turnover in the second frame, timely three point shots from Moffo and Dalton Watt, as well as strong rebounding helped Buckeye outscore the visitors 15-11 in the second, trailing 39-32 at the break. The third quarter was fairly even between the teams, as every time BL made a push, the Jets were able to get the lead back to double-digits, forcing five more Panthers turnovers in the quarter. Aggressive inside play from Stuart White and Andrew Smith helped push the hosts to the foul line early and often, pushing the visitors towards the bonus sooner rather than later. With this play, the Jets went into the fourth holding a comfortable 56-46 cushion. In the final quarter, Union Local rushed out early, then clamped down, effectively playing keep away and forcing the hosts to foul, killing the clock from roughly the six minute mark until there were a little over two minutes left. In all, the Jets hit 11 shots from the charity stripe over the final eight minutes, while the Panthers managed a mere nine points with Kildow, Merritt and Dakota Hess doing the lion’s share of the scoring. When the final buzzer sounded, the scoreboard was lit 72-55 in favor of Union Local. The Jets were led by Kildow, who finished with 23 points and five steals. Merritt finished with 19. Both hit three of bonus bombs. Moffo scored 18 to lead the Panthers with trio of threes of his own and five boards. Luke Darrah added 13 points and seven rebounds.